It's been a good first week of A Year of Less Spending. Sharing this challenge here was definitely the right thing for me to do and it's been great to read that many of you are also trying to reduce your spending. Starting this challenge in September is the perfect time for me as autumn always feels like a fresh start, as many of you commented. Over the summer holidays I deliberated over how I could reduce my spending and whether I could manage a year long shopping ban. I've been so inspired by Cait Flanders and her success with her shopping ban. However, I knew a total shopping ban was not for me. My aims are to be more mindful of our general spending, to spend less on groceries and clothes (my weak areas) and to go back to basics with menu planning, using a spending diary and cooking more from scratch and in bulk. I hope that at the end of the year I'll have wasted less money on stuff and allocated more of our money for experiences and savings for future goals. There's probably not much difference between my challenge and a total shopping ban. It just feels less restrictive and allows for the occasional treat. I hope to post an update of this challenge weekly or at least monthly. I'm interested in recording menu plans and seeing how much I spend each week/month on groceries. 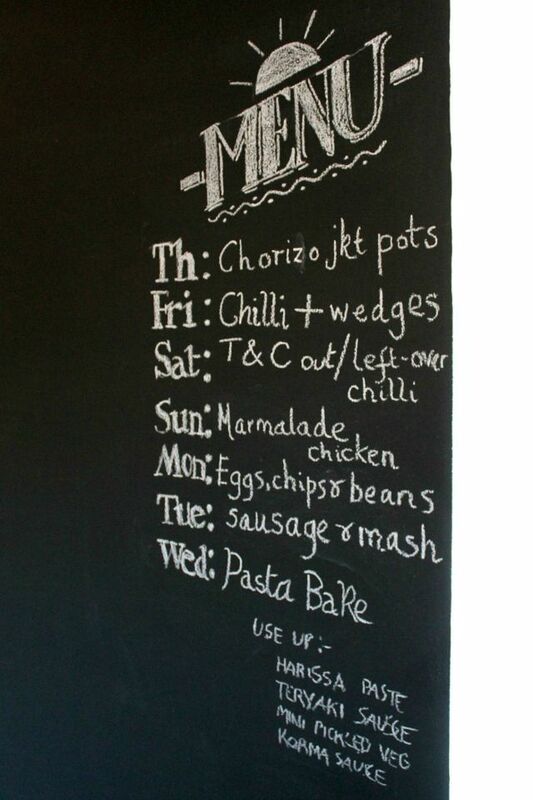 I love reading menu plans and food budgets online and I feel it's only fair that I share mine after all the inspiration and tips I've learnt from fellow bloggers. Also, being accountable here will hopefully encourage me to stick to a budget. So here's a roundup of my first week. Grocery shopping: £89.97 (budget £92 per week/£400 per month for four of us which includes food, household items and toiletries). I shopped with cash at my favourite budget friendly supermarket. A few items were bought in another supermarket and I also shopped at our local green grocers. This week I only worked two days and I had plenty of time and energy to plan and shop carefully. I'm sure this will be more challenging in the weeks that I have more work. However, I'm very pleased with the total. Spending diary: It was exciting opening my new notebook (an end of year teacher present) and recording my first few days of spending. It was a spendy week with our car needing a repair, MOT and service but it actually had no problems which was a lovely surprise. I recorded every little spend such as parking when I took my son to the dentists. Keeping a spending diary certainly makes you aware of every little expense. Clothes shopping: No browsing online and I kept my blinkers on when in town. I think a good wardrobe tidy will also keep me on the straight and narrow - it's long overdue. Treats: We were treated to a one year old's birthday party (Tim's great nephew) and our friend hosted a meal for her 50th in a restaurant. We were spoilt with both great company and food (Spongebob Squarepants birthday cake in the afternoon and an Indian meal in the evening). Motivation: My motivation is sky high. Every temptation is met by "No, this is The Year of Less Spending". Temptations: I was tempted by some perennials for sale on a drive in a local village when I dropped the car off but I realised I still have cuttings to plant and there's not that much space left in our tiny garden. Menu: Highlights were Jack Monroe's veggie chilli (I added extra chilli flakes and chilli chocolate) and an apple and blackberry crumble. We had two brilliantly simple Nigel Slater staples, marmalade chicken and chorizo jacket potatoes, both from his excellent Eat book. I'll leave you with a few foodie photos to round off week 1. Have you kept within your budget this week and managed less spending? I'd love to hear. 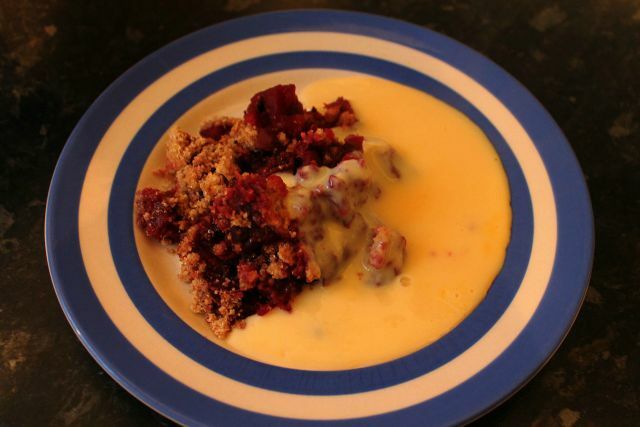 Apple and blackberry crumble with custard as it was the cheapest accompaniment. 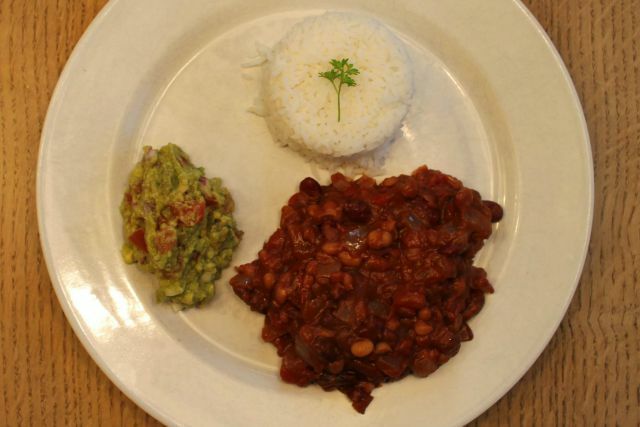 Veg chilli with rice as it was easier than potato wedges. The boys had a meat version. 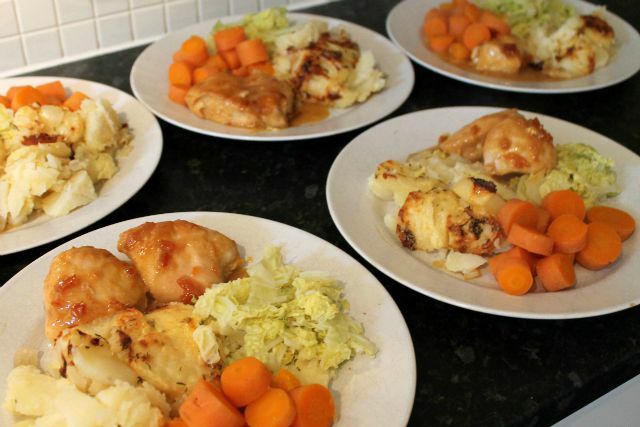 Nigel Slater's marmalade chicken for five as Mum came round. The sauce was delicious. 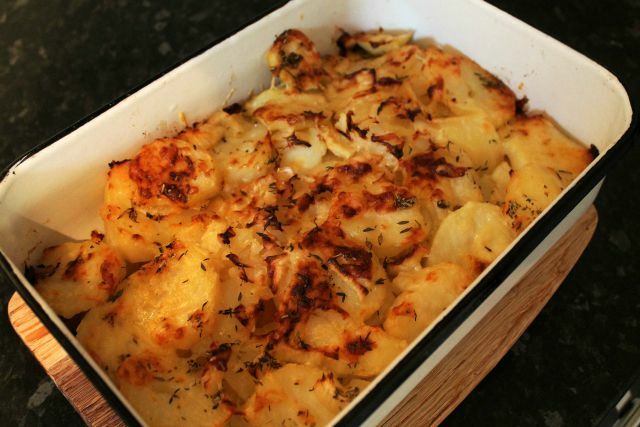 And potato gratin which is a firm favourite in our house. I'm really trying to cut back. September has so far been expensive - 3 birthdays, a cheap holiday in 2weeks to Cornwall (our first proper holiday for a year), getting our youngest back for a 4th yr at uni and the car tax. Trying to cook from our freezer and use up first. It's testing times! Such lovely clothes in the shops too!! September is expensive. We have our eldest back at uni too and our youngest has started sixth form which means new clothes. I'm not looking in any shop windows, browsing online and any clothes catalogues go straight in the recycling bin (must try and get my name off their mailing lists). I started the month highly motivated and tracked my spending the first few days. Then there were unexpected expenses and I got discouraged. I keep thinking I need to wait until October to try again, but that's just silly. I can start anytime and after reading your post, I'm starting again right now. I hope I can keep my spending diary up. It's just going to have to be a habit to get me through the year. I would like to read this, it sounds realistic - can I justify it though? Hi Claire! Although I haven't left a comment for a while I've enjoyed reading all your posts as usual. Just wanted to let you know that I'm joining in with the Year of Less Spending idea as it is more realistic for me than a total shopping ban. This goes well with my intention to continue being a more thoughtful consumer. Hi Megan! So glad you're in on this - having support from others will help I'm sure. I'm hoping to change a few bad spending habits over the year and become less attached to stuff. Well done. Your grocery budget is impressive for 4. I've always overspent on food, probably more than anything. I do have a budget now but in comparison it is pretty generous. Thank you Michelle. I hope I can keep this going for a year!